Elle is the worlds largest selling fashion magazine, with 38 editions world wide. In every market that it has entered, Elle has successfully acquired a quality reach among discerning, affluent and innovative women. 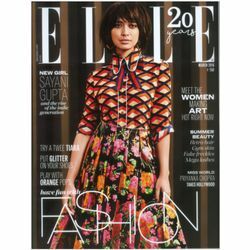 Elle India has met the expectations of the emerging Indian woman, who is today open to western influences while keeping her Indian roots. Editorially, the magazine is outward looking - it detects, discovers, discusses. It offers freedom of choice, not prescriptive advice. Elle is about looking and feeling good.